i downloaded a gameboot.pmf but i dont know how to install/run from my psp i am on 5.03 gen-c i also have a phat on 5.00 m33-6. so my question is how do i run a gameboot.pmf? - I don't ask for much but rep is appreciated. ms0 is what ever drive comes up when you go into flash0 in recovery mode.mine is G but could be any letter depending on your pc.if it is longer then 2.5 seconds and most of them are now a days you will need to flash the opening_plugin.rco that comes with it or modify the one you have to allow the full playback. will it work if i access flash0 from the VSH menu or only in recovery? i switched to flash0 and went to VSH/resource and put the gameboot.pmf in the folder i named as gameboot1.pmf for example. is there a part i missed to running this? and how would i flash the opening_plugin.rco if that is needed? Last edited by thatrandomguy; 05-23-2010 at 01:54 PM. 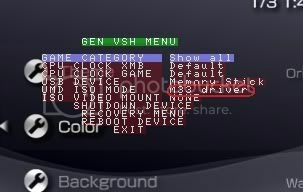 yes you can use the vsh menu in the xmb just change the usb device from memory stick to flash0. then you will see the folders vsh/resource and in there thats where the gameboot is.rename it to gameboot.old or copy it to save later or just orver write it with your new one.theres no need to make any new folders. try that and test if the whole thing plays then ur set if not you will need to modify the opening_plugin.rco thats also in that folder but cross one bridge at a time. you can always tell for a 2.5 second gboot is like 300 k but ya get that far and then youll know anyway man. I'd be cautious with flashing ANYTHING to an unhackable PSP, just a word of warning. thanks guys i got it working and ya thanks for the heads up you never know when it could happen accidently. Last edited by thatrandomguy; 05-23-2010 at 07:51 PM. well when copy it over it should ask you if you want to replace. that link seems to be broken if not broken then sorry for the inconvenience. this one seems to work. what became of that ?